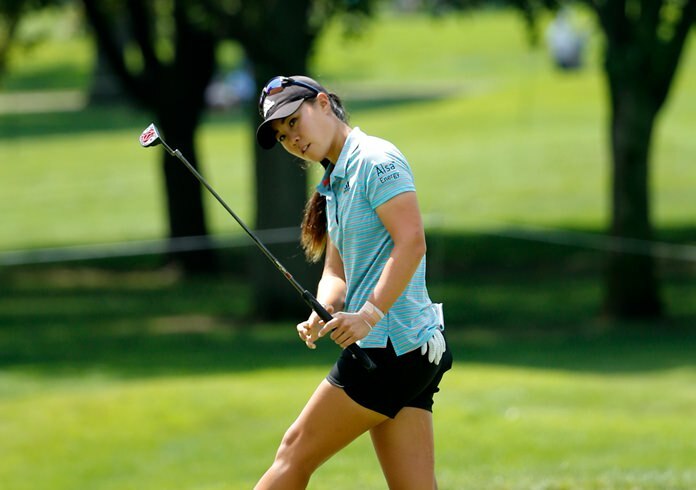 Olympia Fields, Ill. (AP) — Danielle Kang won back-to-back majors as an amateur yet she’s never cracked the winner’s circle in her half-dozen years as a pro. The 24-year-old Californian took a big step in the right direction, grabbing a share of the second-round lead in the morning wave Friday at the KPMG Women’s PGA Championship. Her biggest hurdle could well be co-leader Sei Young Kim, the LPGA Tour’s 2015 Rookie of the Year and already a six-time winner on tour. Kang and Kim each shot 5-under 66 to reach 7-under 135. First-round leader Amy Yang (71), Chella Choi (70), Brittany Lincicome (66), Jodi Ewart Shadoff (66) and Mi Hyang Lee (67) were another stroke back. So Yeon Ryu (68), who climbed to No. 1 in the world ranking after a victory last week and won the LPGA Tour’s first major of the season, was at 5 under, along with defending champion Brooke Henderson (69), Moriya Jutanugarn (68) and Sarah Jane Smith (67). Lydia Ko shot 68 to put herself back in contention at 4 under. Michelle Wie also was 4 under, following her opening 68 with a 70. Kang, the U.S. Women’s Amateur champion in 2010-11, conceded she didn’t have a game plan after her last practice round at Olympia Fields Country Club, one of several venues that previously hosted men’s majors now being tested by the women. Alex Kang, who plies his trade on the Web .com Tour, was familiar with Olympia Fields and its bunkers, and he gave her some simple advice. “He goes, ‘Just blast it down,'” she recalled. The plan worked as Kang, relying on her driver, hit 11 of 14 fairways and hasn’t made a bogey through 36 holes. Kim carved her path up the leaderboard with a closing flourish, making three birdies in her last five holes. They came on the tougher front-nine side, though players caught a break as the swirling wind that made club selection dicey Thursday subsided in round two. The KPMG kicks off a stretch of three majors in six weeks and Ryu could cement her new No. 1 status by adding a second major to the one she claimed in May by beating Lexi Thompson in a playoff at the ANA Inspiration. The LPGA Tour staged a brief celebration as she teed off Thursday, draping her caddie, Tom Watson, in a special green bib. Yang was on the 18th fairway a day earlier when play was suspended because of lightning. She returned just before 8 a.m. to complete her first round and made a birdie for a 65. Although she got to 7 under, she couldn’t hold it. Kelly Shon, who opened with a 77, notched the low round of the tournament and tied a competitive course record with a 63. The former Princeton player made six birdies and an eagle without a bogey, placing her name in the Olympia Fields record book alongside Patty Sheehan and Meg Mallon and Rickie Fowler and Vijay Singh (who played the course with a par of 70). Shon knew something special was happening when she rolled in a 90-foot putt for eagle at No. 2. Among those missing the cut at 3 over were major champions Ariya Jutanugarn, the No. 2 ranked player in the world, and Anna Nordqvist.